Printex offers the best water developing product in the industry barr none, our G2-73 photopolymer plate. No chemicals needed here, the G2-73 develops in plain tap water, is bio-degradable and features high-detail graphic reproduction characteristics. 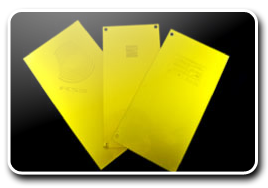 Join the many customers who have gone Green and start using our G2-73 photopolymer plate today. Please contact our technical or customer service representatives to discuss your application.